Chef Peking can cater a variety of functions you are looking to host for that special occasion. Our staff are friendly and efficient and will do everything possible to ensure your function goes to your standard. Your wedding is a special day and we aim to help it become your dream. Chef Peking can host your wedding and the reception party leaving you time to relax and enjoy your day. With the champagne on ice and the food flowing, your party is going to be a great success with the help of Chef Peking's fantastic staff and atmosphere. Treating your employees to a wonderful lunch or perhaps celebrating a co-workers party? Chef Peking is an idyllic setting for all the staff to wind down and enjoy their time together. 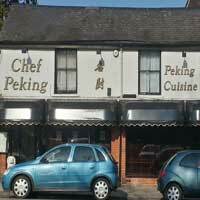 If you are interested in using Chef Peking for a function, then contact us today.